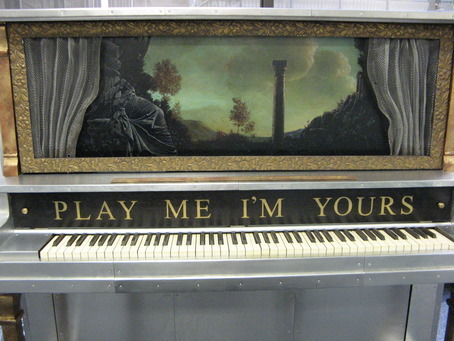 This piano is designed by Alexander Mihaylovich and hosted by L.A. LIVE. Singer/songwriter Sarah Ault came up with the concept of shooting at as many pianos as we could in one day! So we shot a quick music video for her track "Over My Head". The experience was like an exciting and unique scavenger hunt. Incredibly fun. Much thanks for coming to our city! Elson and Valentin prove that humans and puppets can live in perfect harmony. 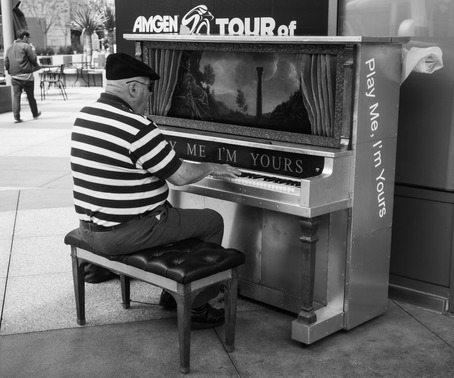 Sometimes, a street piano can mean a puppet show! At the turn around mark on the Street Piano Circuit walking Phase. We started at Union Station, hit China Town,Art School,Bunker hill both sides Music center was already gone,so I will make my way to the Court House. Awesome Piano, find me on youtube by typing my name. Vive Ragtime! Dee & me having fun and goofing around on the piano with the "Charlie Brown" song at L.A. LIVE ! Local artist Jessica Leigh plays her newest song! Gerald Gornik plays Rodgers and Hart's "Manhattan"
Lakers playoff game 2 - LA Live was bustling but all quiet at the piano. 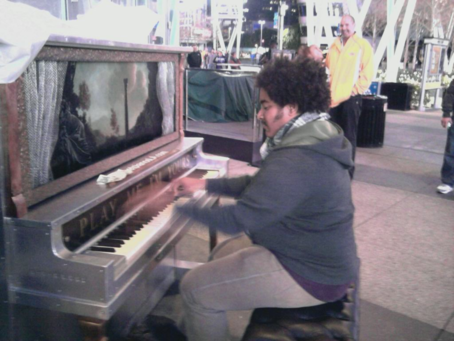 Future virtuoso trying out the piano at LA Live.